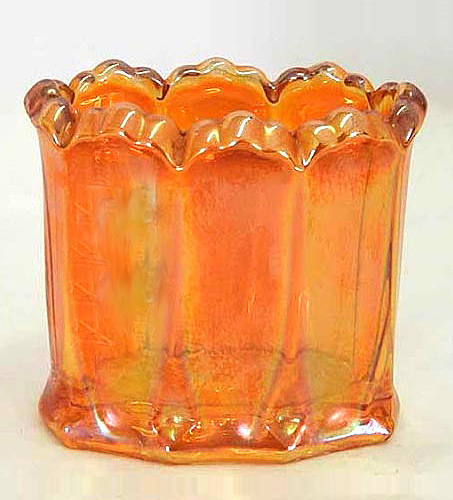 This tiny, 2.25-inch high, oblong piece was listed as a marigold toothpick holder, called Eight Flutes, when it sold in 2017 for $170. Photo courtesy of Seeck Auctions. Glen and Steve Thistlewood have discovered the pattern in a catalog from the Polish glass-maker, Zabkowice. This piece is actually a cigarette holder. You can see the catalog image in Network #41. Also in NetworK #41 you can see the Zabkowice catalog image and photographs of a large, probably cigar, Ring-Around ashtray. Glen and Steve also report that the Ring-Around pattern was used around the perimeter of some of Zabkowice's Golden Patterns.